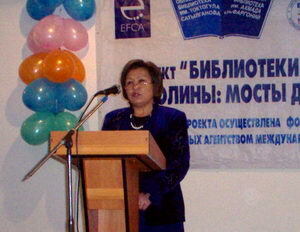 On November 28-29, 2006 at Osh regional library named after Toktogul under the project «Fergana valley libraries: bridges of friendship» the regional library forum was held under the motto «From achievement of consent to success of actions». The Forum objective was the development of the province libraries as the centers of information and cultural exchange between the people of Fergana valley, increase of a level of knowledge in library computer technologies and the opportunities of introduction of electronic catalogues in work of libraries. Official visitors, the representatives of Osh regional administration, Osh regional management of culture, the National library of Kyrgyzstan, the National library of Uzbekistan after A.Navoi, the directors of Fergana valley regional libraries have taken part in the official opening ceremony of the library forum. Among the visitors and participants of the Forum there were the representatives of the libraries from Kyrgyzstan - Jalalabad, Batken, Osh areas, from Uzbekistan - Andijan, Fergana regions - Rishtan, Furkat, Kuva and Fergana areas, from Tajikistan - the directors of CBS of Isfara, Istaravshan. In the first day of the forum there was a plenary session: «Fergana valley libraries development Modern condition and prospects» at which the directors' reports from Fergana, Khujand and Osh libraries about the fettle and problems of the libraries of Fergana valley have been heard. With the report on the fettle of Uzbekistan libraries at the present stage, during the execution of the Uzbekistan president decision «About organization of the information-library supply of the Republic population» presented the deputy director of the National library of Uzbekistan after A.Navoi - Maminova I.Z. Presentation of the project «Fergana valley Libraries: bridges of friendship». Presentation of the electronic catalogue built by the Osh library. Prospects and technologies of library resources building and information exchange. Automation of the library processes. Problems of library automation and solutions. For the library managers - where the questions of work coordination and building conditions for uniform information space in Fergana valley region and studying the methods of computer technologies introduction, as the way of rising the role of the libraries in the society were taken up. For librarians - the opportunities and efficiency of the electronic catalogues systems introduction into practice of the libraries work and increase of the knowledge level in computer library technologies field were covered. For the libraries managers a round table «The problems of acquisition and storage of the book funds» has been organized the basic objective of which was to cover improvement of the library work in issues of acquisition and the documents safety maintenance. «Automation of library processes» and «Problems of the libraries automation and the solutions» sections were conducted by the manager of scientific and marketing researches department of the Uzbekistan national library after A.Navoi, the senior lecturer of the TashSIK Karimov U.F. and the deputy director on the new technologies of the Kyrgyzstan national library Alipov K.
In the forum conclusion there was a plenary session: «Summarizing the forum» the objective of which was generalization of the sections work results and coordination of the further actions on development of the Fergana valley libraries cooperation, and also the development of the corporate development of the Fergana valley libraries project concept and building a uniform information space. At the solemn closing ceremony of the Forum a partnership and cooperation agreement between the libraries of Fergana valley has been signed. All the participants of the Forum were presented the electronic catalogue СD disks of the Osh library and memorable gifts. On occasion of the International library Forum closing a solemn banquet and a concert program with participation of all visitors has been organized.